Having recently completed the iOS 7 updates for all my apps, I began thinking about a new project for the iOS platform. It would have to be something I was personally interested in, and in a niche which is not currently well-served by any of the existing apps in the App Store. This is easier said than done, given how the App Store is stuffed to the gills in seemingly every category! Today I’m pleased to announce my new iOS app, Cactus Album, coming to the App Store in 2014. Anyone who follows me on Twitter knows I have a bunch of other interests aside from writing apps. While I’m heavily into Bonsai (and created an app for that), I’m also a collector of cacti and succulents. This hobby began as a child when a neighbour in Australia got me started with a few tiny cacti, one of which was already 10 years old at the time. Since moving to the US, my parents have looked after them, and from what I hear, they’re still doing great. About 5 years ago I caught the cactus bug again and was always on the look-out for new specimens at nurseries and on eBay. You can see a bunch of my acquisitions on Flickr in the following photo sets: 1, 2, 3, 4, 5, 6. Over the years I’ve also visited the fantastic cactus and succulent collection at the Chicago Botanic Garden, collections at the Royal Botanic Gardens (Sydney, Australia) and Adelaide Botanic Gardens (Adelaide, Australia), and the cacti and succulent show and sale at Chicago Botanic Garden. One thing you’ll slowly learn is that while most cacti thrive on neglect, some are rather picky about exactly how they’re neglected. They need fast-draining and coarse soil, plenty of light, occasional fertilizing, and water free of many of the additives you’ll find in tap water. 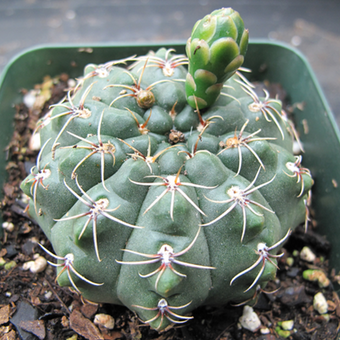 The more pickier cacti have specific watering schedules, sometimes requiring no water for months at a time. Failure to adhere to any of the above may lead to sick or dead cacti. RIP, poor Lithops. It would be nice to have an app to keep track of specific cacti, wouldn’t it? For the longest time I resisted writing such an app, being rather busy on other projects. Over the past few weeks I’ve been researching apps on the App Store for keeping track of my cacti and succulent collection. While I found several with information or photos, I didn’t find much at all that would suit my purposes. No doubt there are many other cacti fans who would appreciate an iPhone or iPad app to organize their collections. A good many of these are probably getting by right now with cobbled-together spreadsheets or databases on their computers, or maybe not tracking anything at all. This niche is definitely small, but it’s an area where there seems to be a noticeable gap in the market. I don’t have a full feature list locked down at this point, but if you’re familiar with my Bonsai Album app, you should get a fairly good idea of what I’m planning for Cactus Album. It’ll be a universal app, meaning it’ll work on your iPhone, iPad, or iPod touch. If you’re interested in learning more about Cactus Album, visit the Cactus Album Facebook page or sign up at CactusAlbum.com to be notified via email when the app launches (and also when the Beta test begins). I’m excited about working on Cactus Album, and I look forward to providing more information closer to launch!